Sevilla remain hopeful of bringing prodigal son Jesús Navas back to Ramón Sánchez Pizjuán this summer, according to the Radio Sevilla branch of Cadena SER. This is not a new link and a similar story was reported earlier this month by the same source. However, the Andalusian club still haven’t given up on the 30-year-old, who has always said openly that he’d like to return to the club where he made a name for himself. The obstacle blocking this reunion could be none other than Pep Guardiola. 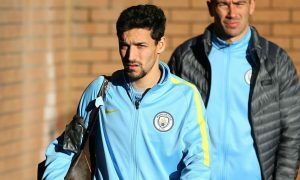 He is still deciding on the make-up of his squad and may yet decide to retain Navas, who was one of City’s livelier performers in the win over Borussia Dortmund earlier today. The expected arrival of Leroy Sané, usually deployed on the right by Schalke, could open the door for a Navas departure, but it’s just as possible that the two would rotate. Sevilla have sold Ciro Immobile to Lazio and signs are that fellow attackers Kévin Gameiro and Fernando Llorente could follow, leaving Sevilla in need of attacking reinforcements. As all City fans know, Navas offers precious little in the goal-scoring department, but can create goals. With deals for Leroy Sané, Marlos Moreno and Gabriel Jesus all thought to be close, City’s transfer market should spring to life again after a recent lull, and with players arriving, some must go. But will Jesús Navas be one of those heading through the exit door this summer?